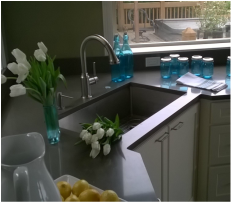 Paula graduated from the Seattle Art Institute for Interior Design 19 years ago and has specialized in the Kitchen & Bath field as a NKBA Certified Master Kitchen & Bath Designer. She is an award winning designer and has been featured in multiple publications. She has a heart for this industry and for her clients who she is grateful to serve. On her website you will find this quote: "A pleasant environment touches our emotions. We thrive and feel refreshed when spaces we enter invite a visual experience. Our relationship to our spaces, can be felt internally and externally as our home becomes an extension of ourselves." This section is under construction, more to come.